So my conclusion is that Klein, who says she wrote this book quickly, to respond to the current moment, with less attention to endnotes than usual, is generally reliable on facts. The way in which I reached that conclusion is a pretty good example of the strategies outlined in Web Literacy for Student Fact-Checkers, and a reminder that those methods aren’t just for students. All of us — me, you, Naomi Klein, everyone — need to build those muscles and exercise them regularly. I was previously aware of Naomi Klein but had never heard her speak, had read none of her books, and was only slightly familiar with her critique of corporatized politics. Her conversation with Chris Lydon on that podcast prompted me to read her new book, No Is Not Enough, published just a few weeks ago. I was also slightly familiar with criticism of Klein’s views. So, in a moment when the president of the United States had just tweeted a video of himself performing a mock attack during his time as a reality TV personality on the pro wrestling circuit, I was curious to know her thoughts but also prepared to take them with a grain of salt. People keep asking — is he going to divest? Is he going to sell his businesses? Is Ivanka going to? But it’s not at all clear what these questions even mean, because their primary businesses are their names. You can’t disentangle Trump the man from Trump the brand; those two entities merged long ago. Every time he sets foot in one of his properties — a golf club, a hotel, a beach club — White House press corps in tow, he is increasing his overall brand value, which allows his company to sell more memberships, rent more rooms, and increase fees. I hope we can agree across ideologies that this kind of thing is unhealthy. In the audio clip I cited above, Klein notes that the antidote is not a liberal megabrand, not Zuckerberg or Oprah. Conflation of brand power and political power is just a bad idea, and we need to reckon with that. 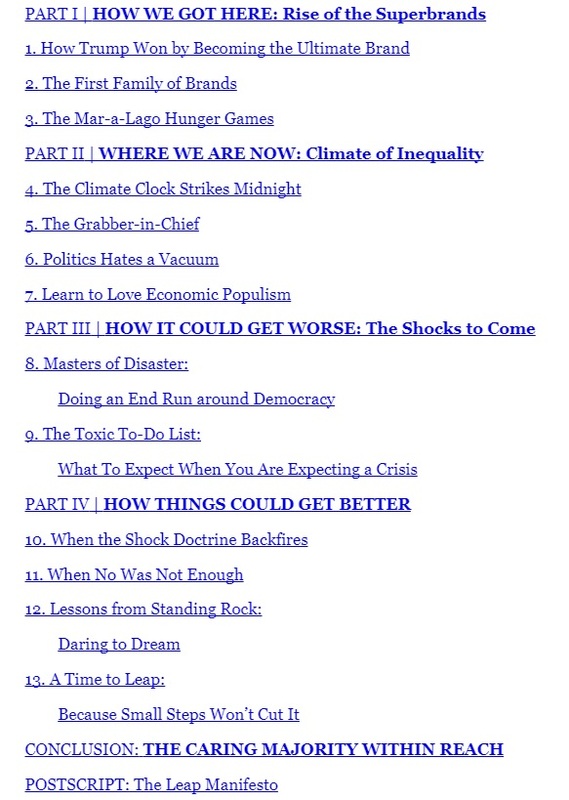 The rest of the book builds on arguments made in her earlier ones: Capitalism’s winners exploit natural and man-made crises to consolidate their winnings (The Shock Doctrine); climate change presents an existential challenge to that world order (This Changes Everything). 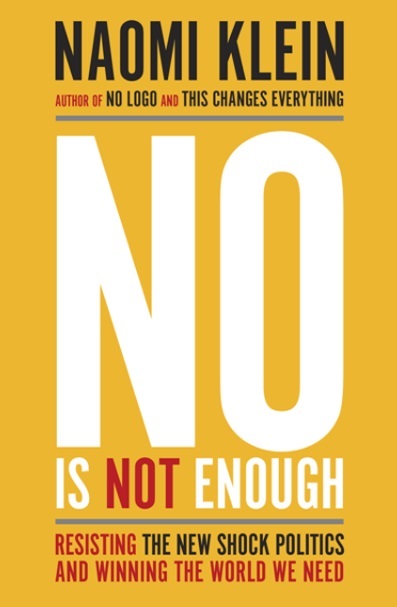 Since I haven’t read those books, and have only just now read a few reviews pro and con, I lack the full context needed to evaluate the arguments in No Is Not Enough. But that’s exactly the right setup for the point about fact-checking that I want to make here. The last sentence sent me to Google, where I quickly learned it had been debunked in a tweetstorm by Ted Frank in January 2017. He works for a libertarian think tank, and I doubt we’d see eye to eye on many issues, but his takedown of the 27-cent claim was accurate. Politico, for example, corrected its version of the story. I went on to spot-check a number of other claims in No Is Not Enough and again, so far as I can tell with modest effort, everything checks out. So my conclusion is that Klein, who says she wrote this book quickly, to respond to the current moment, with less attention to endnotes than usual, is generally reliable on facts. I agree completely with Ralph, I did not know we were going to make the world safe for Goldman Sachs, and I am a little surprised to find three or four or five of these guys, one or two might have been OK. Author Jon UdellPosted on 8 Jul 2017 8 Jul 2017 Categories . The idea that big brand-name branding begins with Trump is ludicrous. Stalin was a brand name! Chairman Mao was a brand name! The very idea that capitalism is something special is laughable. Markets have always existed and they always will. Graeber, as I recall, has a real contended bone with interest. (That sentence can be read in several interesting ways.) Apparently he never studied economics/finance. Or, if he ever did, he never thought about any of it. I am waiting for their book-length treatment of the failure of price discovery in the paper towels and toilet paper aisle at the grocery store. I would love a Youtube video of Graeber and/or Klein buying toilet paper. This is assuming that they don’t have someone else do that sort of thing for them — for a murky price. I wonder how they feel about tipping. I gather that the marketing team at Klein’s publisher decided that the phrase ‘shock doctrine’ should be included on the cover of her new book, as it is now part of the Klein BRAND! I look forward to your efforts to fact-check Klein. Some time back, Jon, I posted here about the difficulty in maintaining civil argument in a commercial internet designed for shouting-army-building. I keep my blog private now, and my friends are all civilized people who do sometimes disagree, but were I to get a post like the above, I’d send it back and ask to poster to try again without the contempt and dickswinging. If the person continued in this vein I’d show him the door. Which is too bad. 15 years ago I regretted publicly the way blogs were turning into clubby little salons which were against the spirit and openness of well-run usenet groups and bbses. But given a decade of the destructive influence of troll-based conversation, in which people are encouraged to be vile at each other, there’s probably no choice unless you plan to start buying stamps again. The poster above might be interested to know that, thanks to an Obama-era law, you do have to pay interns unless you are a nonprofit. Either the internship must be beefy enough as a training program to qualify as legit education, in which case they can get college credit, or you have to pay them money, like the employees they are. If he knows people who are working interns for free, he knows crooks who are preying on students and should turn them in.